The name of Camillo Golgi is usually associated to his pivotal discoveries in the field of neurosciences (the “black reaction” that paved the way to the study of nervous cells and earned him the Prize Nobel in 1906) and in the field of cell biology (in particular the discovery of the intracellular apparatus that holds his name). 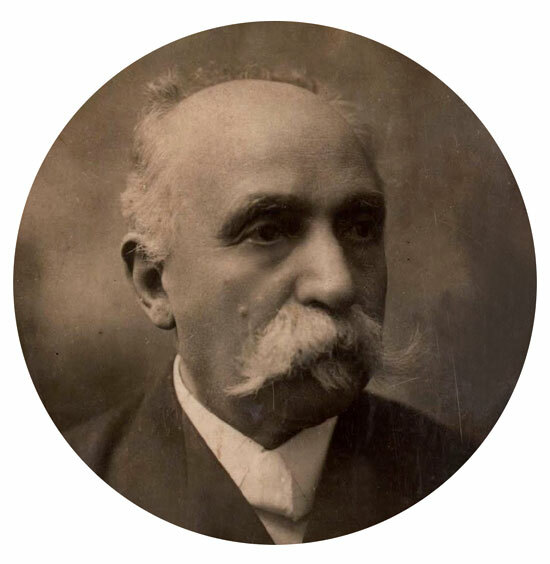 However, Camillo Golgi deserves our gratitude also for his pioneer investigations on malaria in the years immediately following the discovery of the etiologic agent of malaria by Alphonse Laveran in 1880 at Constantine, in Algeria. In particular, this brief note is intended to pay tribute to the contribution of Camillo Golgi to the understanding of the parasite biology and life cycle, leaving aside his other better-known discoveries. Bartolomeo Camillo Emilio Golgi was born on July 7th, 1843, in a remote mountain village (Pisogneto di Corteno, later renamed Corteno Golgi) of Camonica valley near Brescia, in northern Italy, as the third son of the local physician Alessandro Golgi and of his cousin Carolina Golgi, both native of the famous University town of Pavia. At the age of fourteen he moved to Lovere, on the shore of the lake of Iseo, to attend secondary school before moving to his family origin town of Pavia, following his fathers’ paths, to attend the School of Medicine at the local University. At that time, the University of Pavia (Alma Ticinensis Universitas) was at the zenith of its millenary glory and was considered among the best Universities in Europe after a number of famous writers (Ugo Foscolo, Cesare Beccaria) and scientists (Giovan Battista Morgani, Lazzaro Spallanzani, Alessandro Volta) attended the University. Although Pavia was indeed a very different place from his small mountain native village, Camillo Golgi soon proved to be a brilliant university student and graduated on August 7th, 1865, under the mentorship of the famous criminologist Cesare Lombroso, defending a memory on the pathogenesis of mental diseases. It may sound strange that the name of a scientist is associated to so different fields such as infectious diseases – malaria in particular – and neurosciences. Such apparent discrepancy may be better understood if one considers that Golgi was completely absorbed by the positivistic atmosphere of his times, when microbiology was at its vigorous infancy, and that he perfectly mastered the use of the positivistic instrument per antonomasia, the microscope. Furthermore, Pavia was a privileged place for microbiologic studies as the echoes of the studies of Lazzaro Spallanzani and Agostino Bassi still permeated the scientific live of the small Italian university town. The fascinating world of microbes attracted the attention of Camillo Golgi since the beginning of the 1880s and he dedicated himself to this new discipline with the same tireless passion that he used to study the nervous system. Also in the field of infectious diseases the microscope, in Camillo Golgis’s hands, took the connotation of a dynamic – and not static – instrument, providing mighty results. The importance of the work of Golgi in infectious diseases is not only in his personal extraordinary contributions, but also in the wide array of his brilliant disciples who also contributed to the advancement of sciences in this field, such as Adelchi Negri (the rabies “Negri” bodies), Giovan Battista Grassi (discovery of the human anophelic cycle of malaria), Antonio Carini (of Pneumocystis carinii fame), Giuseppe Sanarelli and others. In particular, apart from contributions about antrax and Strongyloides stercoralis, malaria particularly attracted Golgi’s interest after Laveran (1845-1922) first observed parasites in the blood of a malaria patient on November 6th, 1880. It is to be reminded that Italy was a heavily malaria endemic areas, with important health and social impact. Even after Laveran’s observation were lately confirmed by the Roma malariological school – the most scientifically sound at that time headed by Ettore Marchiafava and Angelo Celli – a number of questions still remained unsolved: (i) why different fever periodicity existed in different seasons and in different locations of Italy? (summer-autumn fevers around Rome and spring fevers near Pavia? ); (ii) why malaria may have such different outcomes, ranging from fatal cerebral cases to oligo-symptomatic fevers? ; (iii) which is the most appropriate timing for quinine administration? However, he soon realized that his observations could be applied to autumn malaria (“quartana” or “febbre lunga”, i.e. long fever), while a different type of malaria should be hypothesized to occur in Rome and even in the countryside around Pavia during spring. Despite the unique name of “malaria”, in fact, different microscopic appearance of the intracellular parasites was evident, as he wrote to E. Marchiafava in early 1886. 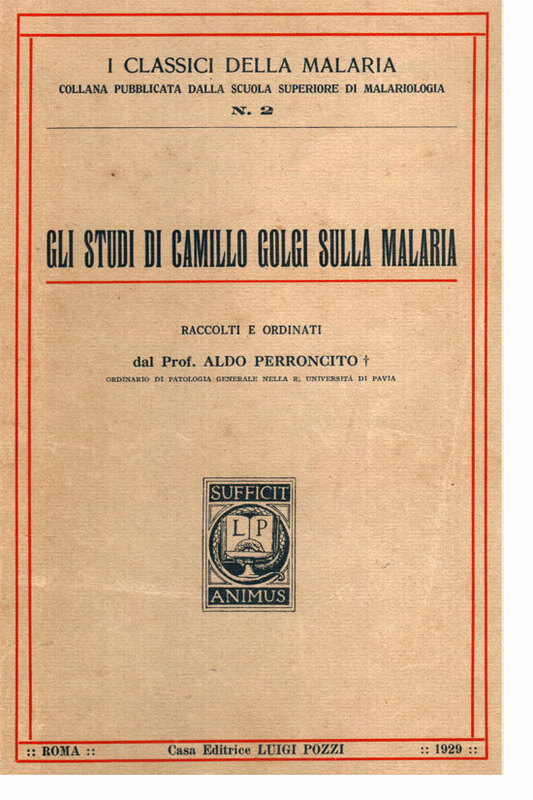 Urged to solve this dilemma, he started to observe tertian malaria cases in Pavia in the following spring and he was able to report on June 5th, 1886, to the Medical Society of Pavia the complete human schizogonic cycle of what is now known to be Plasmodium vivax. (P. falciparum), most prevalent in the Roman countryside, a few years later in 1892. It is to be reminded that all the work of Golgi was performed before specific Romanowsky stain was available, giving even more credit to the highly sophisticated skills of the scientists! Camillo Golgi was awarded the Nobel Prize in 1906, ex-aequo with the Spanish scientist Santiago Ràmon y Cajal, for his works on the microscopical structure of the nervous system. However, at least two other discoveries (the Golgi apparatus in 1898 and the first description of the biological cycle of a malaria parasite in 1885) could have earned him the highest honor in the scientific academy. Goldaniga, G. & Marchetti, G., 1993. Vita e opera dello scienziato camuno Camillo Golgi. Tipolitografia Lineagrafica (Life and achievements of the scientist Camillo Golgi, from Val Camonica), Boario Tenne, Brescia. Golgi, C., 1886a. Sull’infezione malarica (On malaria infection). Archivio per le Scienze Mediche, 10: 109-135. Golgi, C., 1886b. Ancora sull’infezione malarica (Again on malaria infection). Bollettino della Società Medico-Chirurgica di Pavia, 1: 51-53. Golgi, C., 1888. A qual punto del ciclo evolutivo dei parassiti malarici la somministrazione della chinina, arrestandone lo sviluppo, valga ad impedire il più vicino accesso febbrile (When, in the parasite life cycle, it is most appropriate to administer quinine to prevent the next feverish attack). Bollettino della Società Medico-Chirurgica di Pavia, 3: 39-42. Golgi, C., 1890. Sulle febbri intermittenti malariche a lunghi intervalli (On intermittent long-interval malaria revers). Archivio per le Scienze Mediche, 14: 293-313. Golgi, C., 1893. Sulle febbri malariche estivo-autunnali di Roma (On summer-autumnal malarial revers in Rome). Lettera del Prof Camillo Golgi a Guido Baccelii. Gazzetta Medica di Pavia, 2: 481-493. Mazzarello, P., 1996. La struttura nascosta. La vita di Camillo Golgi (The hidden structure. Life of Camillo Golgi). Istituto Editoriale Universitario, Cisalpino.